Visual metaphors in a number of Mahayana sutras construct a discourse in which visual perception serves as a model for knowledge and enlightenment. In the Perfection of Wisdom (Prajnaparamita) and other Mahayana literature, immediate access to reality is symbolized by vision and set in opposition to language and conceptual thinking, which are construed as obscuring reality. In addition to its philosophical manifestations, the tension between vision and language also functioned as a strategy of legitimation in the struggle of the early heterodox Mahayana movement for authority and legitimacy. 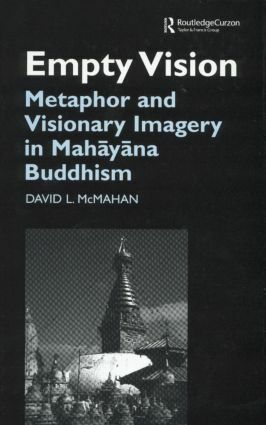 This emphasis on vision also served as a resource for the abundant mythical imagery in Mahayana sutras, imagery that is ritualized in Vajrayana visualization practices. McMahan brings a wide range of literature to bear on this issue, Including a rare analysis of the lavish imagery of the Gandavyuha Sutra in its Indian context. He concludes with a discussion of Indian approaches to visuality in the light of some recent discussions of "ocularcentrism" in the west, inviting scholars to expand the current discussion of vision and its roles in constructing epistemic systems and cultural practices beyond its exclusively European and American focus.